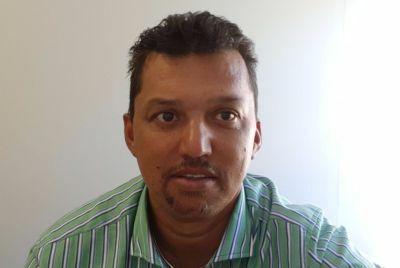 The Church is building on the breakthrough momentum from the recent It’s Time prayer day at Mitchells Plain, but more unity is needed, says Ashley Potts director of the Cape Town Drug Counselling Centre, in the first of a series of articles on the impact of the historical day of prayer on March 24 2018. 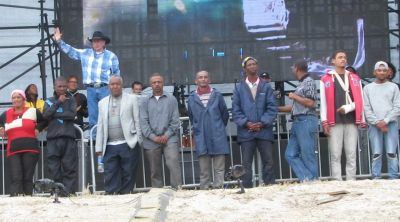 Angus Buchan with gang leaders who responded to an altar call at It’s Time Cape Town. On March 24 a historic event occurred in the heart of a drug and gang-infested community through a national call to prayer by a man called by God to serve our country by following God’s instruction to facilitate a day that will change Cape Town forever. The event itself was executed with absolute precision, thanks to a team of committed, skilful volunteers lead by Deon de Groot who also assisted with the 2017 It’s Time event in Bloemfontein. The day had zero incidents and a 100% clean crime report was announced post the event. Reports from the more than 1 500 volunteers highlighted the extent of the impact It’s Time had on Mitchell’s Plain. Prayer and ministry occurred at almost every stireet intersection. At the main event, after the call to gang leaders to come forward to exchange their guns for God’s word. eight men stepped forward and were given the charge to use their natural leadership influence to serve God. The Church has taken charge and are now hosting weekly open air services as the united body of Christ to respond to the growing cries of a bleeding community. These open air services are a collective initiative and are breaking down the strongholds in communities. A local pastor, Pastor Owen Hendricks of Hope Christian Church “The Healer Outreach”,who is not unfamiliar with this challenging context — having grown up in a very similar community — has offered the use of his resources to offer these services to our communities. The search for the eight men has begun and we are picking up on every lead. All the while, we are working with the two we currently have access to and moving closer to some of the others. I have no doubt that the men we still have to meet are being cared for by those believers living close by. It is still our hope to have a collective discipleship process with them going forward. Having been a son of this community for all my life, and having spent many years working with gangs and youth at risk, I have come to understand that the measure of respect offered results in the same measure being returned. Joining a gang has always been communicated to be final, with little to no room for exit. In my experience, this is however not the case, as I have personally seen men leave their gangs for a number of reasons and with great success. One such means of doing so, would be that of wanting to reform through a real commitment to Christ. This however needs to be followed by a discipleship process that carries fruit and evidence of reported growth. In other words, they cannot use it as an excuse to leave as this in itself will be punishable by the gang itself. So far I have only managed to connect with two of the eigh men — including the one who received Uncle Angus’ Bible. On engaging them, I can safely report that the love for Christ and the life He offered them is growing steadily. I will not reveal their names for obvious reasons. I have met with their senior gang leader who has also given his blessing to release them. Again, I will only say anything more about them at this stage. I do believe that God is at work in the heart of their leader too. I want to call on the Church to seek to serve through any and all means necessary. We also need to be cautioned to not make these men “celebs”, but instead, to make every effort to ensure that they grow in secret — and when they are ready to allow God to open the doors for them to help other young men who are also looking for a way out. That time will come and need not be rushed for any reason. I will share more about the role of the Church and the journey of these young men from week to week. I call on all readers to help locate the other men as we would like to run with a collective discipleship programme with the help of Eric Hofmeyer — a leader in this ministry context. If you have leads or know where I could find these men, please WhatAapp me on 082 887 6440.